» Forum » Tech » Tech: Modern games » CFTBL-Can This Be Fixed? » CFTBL-Can This Be Fixed? Pretty bad corrosion on my board (see pix). Can this even be repaired and any good suggestions on who? TIA! John Wart and Chris Hibler post here. Check with them. Chris Hibler on here does very good work. His handle is ChrisHibler. There are a few other good people here but I haven't used them. My guess is that one is too far gone to be saved. Grab the ASIC chip out & order a new board from the distributor of your choice. I recommend Arcadeshop or K's arcade. Then put the board up on EBay and see if anyone wants it for parts or project. You can recoup a few bucks from it to offset the new one. I'm afraid that one's dead. It would need at least 10 ICs and 50 resistors/diodes/caps replaced in addition to cleaning up the traces. I can see that the corrosion has invaded under the solder mask to the left of U17. And, "it's always worse than it looks like in the picture". Butch2099 is right. Pick up a replacement. 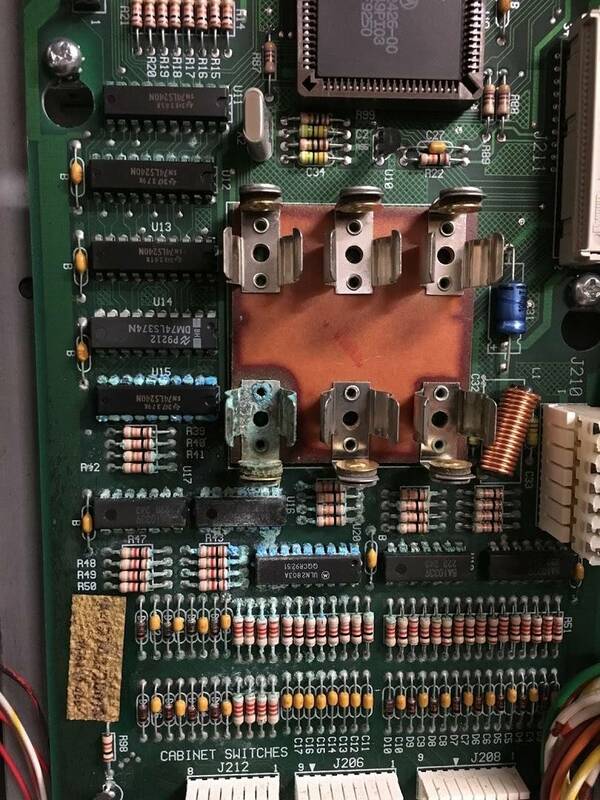 Make sure that the switch matrix connector pins and housings that plug into the bottom of the board haven't been damaged. I would personally avoid Rottendog. They generally introduce their own world of issues. Find a used working or repaired original CPU board. This guy has a couple for sale from a Hurricane and Popeye. His stuff is guaranteed to work and I have bought from him a few times with zero problems. Will most likely work, but double check your part number with the ones in those game manuals. I have had several rottendog boards. I believe I have replaced one transistor and I think that one was my fault. Jim guarantees his boards too. He posts his cell number on the website. If you have a problem with it just call him. Here is another alternative. A drop in replacement of the original design includes the game ROM and NVRAM.